Mighty Muggs were the coolest thing a few years ago. Chunky, urban vinyl inspired figures done by Hasbro…. and done really well. Most of the art was non-conventional, and the character choices were great too (Lando was very early on in the Star Wars line, prompting me to buy all of them from that point forward). 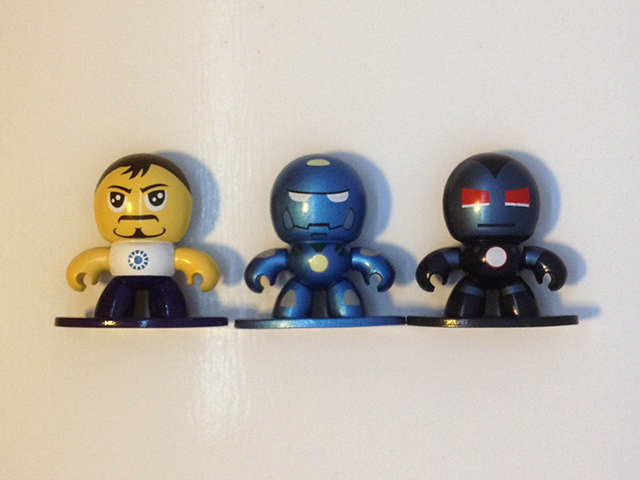 But if there was one major issue with Mighty Muggs it's that they were pretty big. At about 8 inches tall and about 6 inches wide, it only took a few to dominate your shelf space. Back then I begged for Dunny sized Mighty Muggs. They eventually came out, but it was too late and they weren't perfect. They came 3-4 to a pack in those long, really ugly window boxes that you see Star Wars multi packed figures packaged in. They don't display that well and look more like a gift than a collectible. And now many years later, I see that there are Micro Muggs. 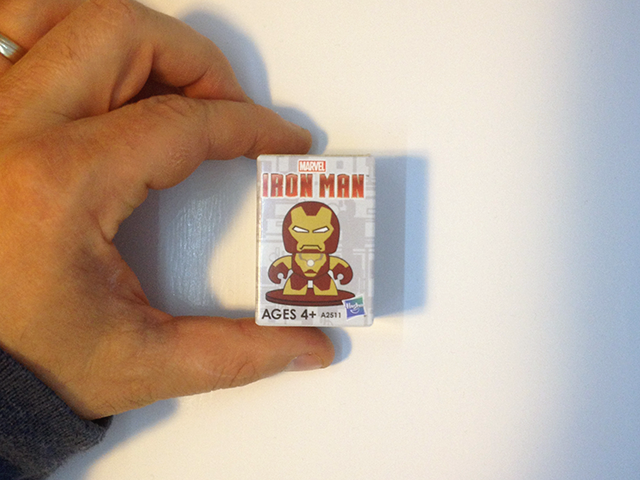 These are WAY smaller, more along the size of a Lego Minifigure or a vending machine toy. Even though they were Iron Man (I've never seen a movie or read an Iron Man comic), I bought a few just to satisfy my curiosity. Click through the jump for more Micro Muggs. I think for micro figures, the size was just fine. But they sacrificed two major things to make them this small. 1) They do not stand on their own and are permanently connected to their bases. I really do not like this. As an action future collector, I'd like to have the possibility to remove the figure from its base, but that is not happening here. (I should not here that they do not have any articulation, but that's fine. 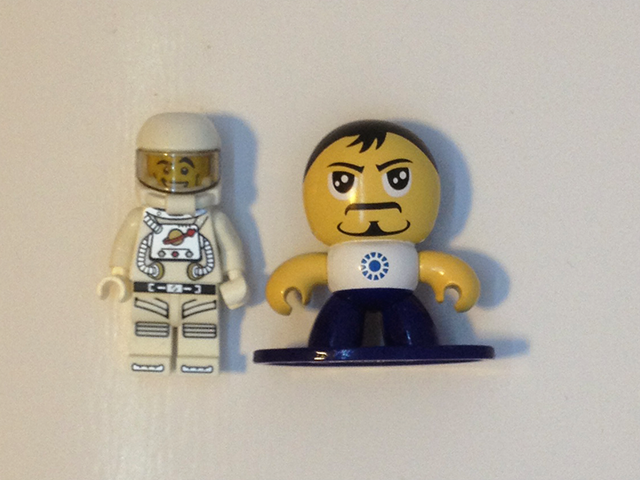 The design of the Mighty Muggs doesn't allow for many poses as it is, so I do not mind the lack of articulation). Also, 2) The head is not quite a head. It's not fully rounded. It's essentially a small head/neck thing, with a domed face sculpted on the front. To better describe this, imagine if your face stopped at the ears and then was flat on the back. It's an odd design choice, which I'm sure was a production decision and not a stylistic one. 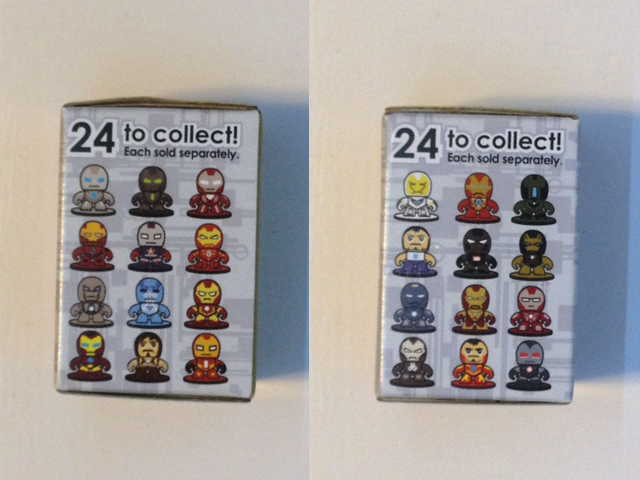 These are Iron Man, so I guess there are 50 different repaints/clones of Iron Man in the movie/comic…. but I would have liked to see more variety. I don't know the subject material at all though, so feel free to blast me on it. I'm just buying these as a fan of the toys. There isn't much else to say about them. I don't mind the faces as much, but I think the bases are what will prevent me from buying too many more of these. The bases pull them away from the action figure / urban vinyl market and make them feel more like a PVC toy. You would think they'd feel like a statue of sorts, but with the history of the Mighty Muggs line, the low price point and the static pose, that isn't the case.